This is a good time for home buyers, with several lending institutions slashing their home loan rates recently. Home buyers have a tendency to skip through the details of a home loan agreement. That should not be the case. Borrowers need to keep in mind a few key clauses while signing the agreement to avoid unpleasant surprises later. Cross-collateralisation of other loans: Imagine a scenario where you have taken a personal loan as well as a home loan from the same institution. 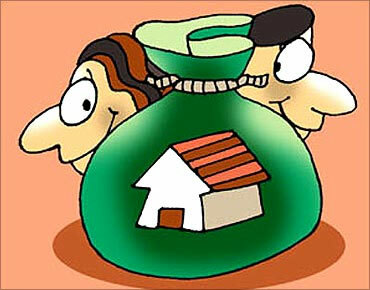 Without your knowledge, you could have actually given your home as collateral for the personal loan. Some lending institutions have an 'Indebtedness of the Borrower' clause where the home is automatically made available as a security for all past, present and future borrowings of the borrower with the same institution. Effectively, your personal loan is secured against your home but the rates being charged are at par with an unsecured loan. In such a scenario, a top-up on the existing home loan would have worked out to be far cheaper than your personal loan. Worse, few institutions cover borrowings from their associates, subsidiaries as well as affiliates under this clause. So, if you have taken a home loan from XYZ Bank Ltd and a car loan from XYZ Car Loans Ltd, a group company, your home could serve as an additional collateral for your car loan. In some cases, the lenders may have an unconditional right to set off any amount paid by the borrower as per the home loan agreement against other borrowings of the borrower with the bank or its affiliates, associates or subsidiaries even without any prior intimation to the borrower. Hence, it is always recommended to have your home loan from an institution with which you do not have any present unsecured obligations. Schemes where equated monthly instalments (EMIs) are borne by the developer: In a typical 75-25 or 80-20 scheme, the borrower takes a loan and the developer agrees to pay interest till possession or a specified period, say, three years, whichever is earlier. Generally, the developer is paid based on the stage of construction. However, in some cases, there are accelerated disbursements — for instance, when the completion stage is only 60 per cent, 80 per cent of the loan gets disbursed. Since the developer is bearing the interest burden, the borrower may not be too concerned. However, the loan is taken in the name of the buyer, so, if the developer defaults, any delay or default will appear in the Cibil report of the buyer for no fault of his. Further, the buyer will be forced to pay interest once the specified period expires even though the property is still under construction. The situation becomes even more precarious if the buyer intends to exit the project midway — many developers charge prohibitively high transfer fees ranging from 2-5 per cent of the completed project value, which effectively increases the exit fee percentage in the case of an under-construction property. For example, if someone had purchased a property at Rs 5,000 per sq ft with a 3 per cent exit fee and he exits the project when it is 50 per cent complete, he ends up paying an exit fee of Rs 150 per sq ft (3 per cent of Rs 5,000) on an investment of Rs 2,500 (or 50 per cent of the total cost), amounting to an effective exit fee of 6 per cent. Further, where accelerated disbursements have been made, it becomes virtually impossible to exit till construction reaches the level of funding. In many cases, buyers are forced to exit at a loss to relieve the burden of the home loan. Hence, the immediate past track record of the developer, management ethos of the promoters and the stage of completion of the project need to be considered before opting for such schemes. Unconditional right to amend terms and conditions: Few agreements have an open-ended draconian clause which gives the lenders sweeping rights at their discretion, to amend, recall, suspend or terminate the home loan agreement irrespective of whether the borrower had complied with the provisions of the home loan agreement or not. Such lopsided agreements are extremely unjust to the borrower and puts him entirely at the mercy of the lender at all times. Setting off other balances: Some loan agreements provide for an unconditional right to set off home loan dues against balances in all other accounts of the borrower, including fixed deposit accounts. So in the event of a strain in repayment of EMIs, the banker has the right to dig into to your savings account, recurring deposit or fixed deposit balances to service your EMI without your consent. Prior approval for any further leverage: Most lending institutions provide that the borrower shall not obtain any further loan or guarantee any further liability without their prior approval. This makes it mandatory for a borrower to approach the lender for a No Objection Certificate (NOC) for any future borrowing. Prohibition on leaving India: Most of the loan agreements prohibit the borrower from leaving India on long stays for the purpose of employment or business overseas without fully repaying the home loan. Where there is a practical need to leave India, it is advisable to inform your banker and obtain an NOC. Onus of clear and marketable title: Assuring yourself that your property has a clear and marketable legal title is important. However, few buyers take independent legal opinion on the title of the property as they feel that the home finance institution funding the property would have done their due diligence. While all lending institutions do their legal due diligence, a lot of weightage is given to the profile of the borrower and the institution's relationship with the developer. For a banker, the loan is given to the borrower and the property is only a security for the loan in the event of default. Most agreements provide that the onus of verifying the legal title is entirely on the borrower and not the lending institution. Every borrower provides a personal guarantee to the banker for repayment of loan, signs a demand promissory note and provides post-dated cheques for the loan value. There have been instances where serious legal issues have been ignored by bankers for various reasons.